The weather has been getting warmer in the Warrendale neighborhood. 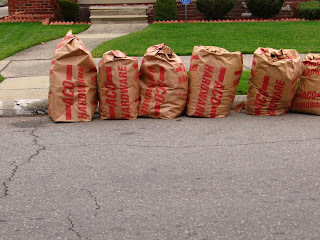 Many folks are starting to spruce up their lawns; leaving their brown yard waste bags at the curb for collection. Ordinarily, this would not be a problem. However, the City of Detroit Department of Public Works does not start its weekly yard waste collection (e.g., leaves, grass clippings, twigs) until the first week in May. The brown bags that are at the curb will not be picked up until your Courville collection day during the week of April 28 – May 2. Yard waste can be dropped off at the Southfield Yard (12255 Southfield Fwy.). Residents can make one trip to the yard daily to dispose of yard waste and bulk trash. Also, please note that yard waste that has been placed in plastic bags will not be picked up at any time and cannot be taken to the Southfield Yard. For detailed information regarding yard waste collection and bulk trash collection, please visit the City of Detroit’s website. I appeared before the Detroit City Council on behalf of the Warrendale Community Organization this past Thursday and asked them to make public safety a much higher priority in the City's upcoming budget. Specifically, the WCO asked the City Council to hire more police officers than what Mayor Kwame M. Kilpatrick proposed his 2008-09 budget request. For anyone who interested, the complete text of my remarks is available on-line here. The WCO only had two minutes in which to address the City Council so those remarks were fairly short. We'll see in the coming days how effective I was with those remarks. hey frank, are there any plans to have block parties in the neighborhood? Or maybe a larger free fesitival? Just a thought. It's funny you should ask. Just the other day, I was talking to the folks who put on the Illuminate Detroit events in downtown and Midtown Detroit about doing a similar one in Warrendale. Illuminate Detroit, for those who aren't familiar with it, is a special event that's put on to showcase all of the great things about living in Detroit - complete with samples from local bars and restaurants as well as fashion and music. It's usually done in close cooperation with real estate developers. It plays a big part in drawing new residents into the city and usually helps to sell 2 or 3 lofts every time they one. If we were to do one of these events this summer, not only would it be a cool event for the neighborhood but it could also help to fill a couple of currently vacant homes in the neighborhood. And, yes, it would also be an interesting way of showcasing our new community garden. More details to come in this blog. Until then, Nick wins my first ever Psychic of the Month Award. I've hesitated for awhile to post about this, for fear that it would cause the gas station owners to raise their prices. However, it's been going on for over a year so I think it's safe. One of the things that I've noticed is that gas prices in Warrendale neighborhood are consistently 5 - 10 cents below average for the Detroit area. 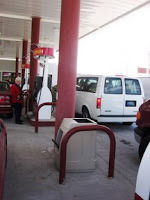 This afternoon BP and Speedy gas stations, both at W. Warren and Evergreen, were each at $3.54 per gallon as was the Citgo Station at W. Warren and Warwick. That's still seems kind of high, but the average for the Detroit area is $3.61 for a gallon of regular gas. In that context, I have to say that while gasoline isn't cheap in Warrendale, it's at least reasonable. And there you have it: reasonable gas prices. The Cool Warrendale Thing of the Week. In my previous post about the Warrendale Community Organ- ization's April membership meeting, I reported that City Council President Kenneth V. Cockrel, Jr. attended the meeting. 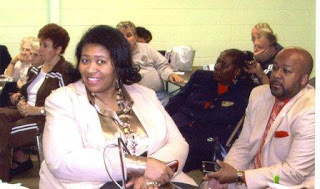 However, I failed to report that Council Member Brenda Jones was also in attendance. I thank all of the members of the City Council who attended and invite the others to our May membership meeting. Photo credit: David L. Malhalab. 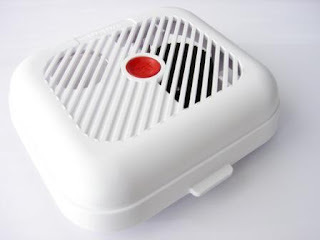 The Detroit Fire Department is offering free smoke alarms to families with small children and/or senior citizens who are low-income. Residents who might qualify are urged to call the Department at (313) 596-2959. Please note that this program is only available to residents of single-family homes or two-family flats. Residents of apartment complexes or other multi-family homes are not eligible. 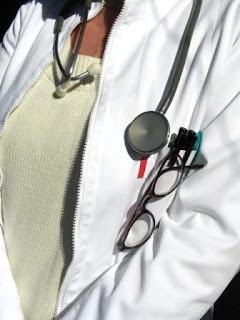 The Joy-Southfield Health & Education Center will present a health education program, "African American Health: Knowing the Risks & Finding the Resources." Presenter Herbert C. Smitherman, Jr., M.D. 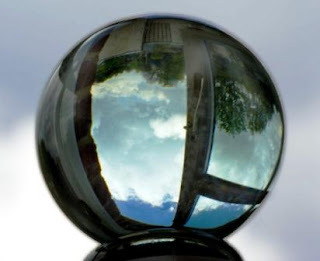 is widely recognized as an expert in this field. The program will be held Saturday, April 19 from 10 - 11:30 a.m. at Second Grace United Methodist Church. The address is 18700 Joy Road, just across the street from the Joy-Southfield Health & Education Center. Door prizes and other incentives will be offered. A flyer is available on-line here. Mayor Kwame M. Kilpatrick will host a series of public forums to explain his plan to stimulate Detroit's sagging economy and to bring jobs to Detroit. There will also be representatives from twenty City Departments present to answer questions and concerns. The closest forum to the Warrendale neighborhood will be at the Northwest Activities Center (18100 Meyers) on Monday, April 21 from 6 - 8 pm. A flyer that includes the other two such forums is available on-line here. The folks at Gracie See Pizza (6889 Greenfield, 313-581- 8070) recently competed in the International Pizza Challenge, which was held at the 25th Annual International Pizza Expo in Las Vegas, Nevada. 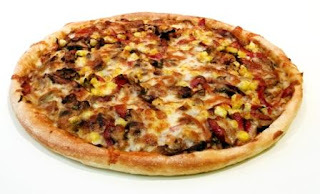 They competed against pizza makers from around the globe and came in second place in the "Best Traditional Pizza" category. Congrats to everyone at Gracie See Pizza! You are the Cool Warrendale Thing of the Week. Several people have emailed me with a link to the Detroit Police Department's crime mapping web site. It enables you to see crime data displayed on a map, so you can see exactly where it's all happening. Click here to visit CrimeView Mapping. One of the Warrendale Community Organization's goals for 2008 is seek drastic improvements in police response time, both within the Warrendale neighborhood and citywide. Specifically, we believe that the Detroit Police Department needs to hire a lot more police officers in order to meet the demands for police services. In most major American cities, there is approximately 1 police officer for every 250 residents. In Detroit, that ratio is 1 police officer for every 413 residents. 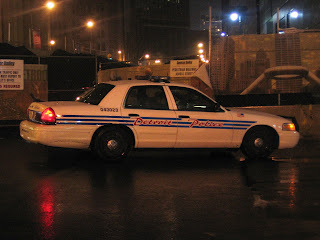 Mayor Kwame M. Kilpatrick has proposed hiring 300 new police officers in his budget for Fiscal Year 2009. While we applaud Mayor Kilpatrick for moving in the right direction, at the March WCO meeting, we as an organization decided that this wasn't enough. We believe that Detroit needs even more than just another 300 more police officers. As a result, the WCO will go before the Detroit City Council on Thursday, April 24 at 5 p.m. We will ask them to make improving police response time a higher priority than it currently is in the City's budget. There is a group of Warrendale residents who originally volunteered to attend this meeting with me. However, I have lost that list. I apologize and hope that most of them read this blog. If you are interested in attending, please send me an email at frank.nemecek [at] gmail.com. However, the other officers ably stepped into the void. Everything that I heard was that it was well-attended and productive meeting. The interesting headline from the event was that Kenneth V. Cockrel, Jr., President of the Detroit City Council, stopped by the meeting. This is the second time that President Cockrel has visited the WCO since assuming his current role, with the previous one being in September 2006. Thanks to David L. Malhalab for sharing this photo from the meeting. I missed a few questions that were left for me in the comments section of various blog posts. With that in mind, I wanted to catch up on them. I am in a simular situation as Hellen wrote in your post. I am currently trying to renovate my father's 2-family home to rent or sell. However, I am concerned with the vacant homes, some of which have been broken into and burned. Does the community make an effort to watch these homes? I understand that your group is a grass roots organization, but would like more information. When is your next meeting, and is it open to anyone? The WCO does the best it can to watch the vacant homes in the neighborhood. However, between the large number of such homes and the fact that we're an all-volunteer grass roots organization, our efforts are admittedly limited. The WCO has its general membership meetings on the first Monday of each month at 7 p.m. in the School Building of St. Thomas Aquinas Church. Everyone is invited to attend. I represent a neighborhood association just west of you, we are having many of the same concerns as your neighborhood it appears (like vacant houses) we are a smaller neighborhood house wise (only 1,268 homes) but about 115 are vacant. I am curious how your organization is dealing with the problem (I saw quite a few on Evergreen between W. Warren and Tireman). The first thing that the Warrendale Community Organization did is to launch a survey of the neighborhood within its boundaries. * This not only gave us some useful information about how many vacant properties we have but where they are and, most importantly, where the worst ones are. Any property that is burned out was reported to the City of Detroit's Department of Buildings & Safety Engineering. They are responsible for determining whether or not a property can be salvaged and, if it can't, to see that it's demolished. Other properties that have various code issues because the property isn't being maintained are reported to Wayne County's Nuisance Abatement Program. Moving forward, I also have a few idea on how to bring in new homeowners. More details on that will appear on this blog and at the WCO meetings as the details are flushed out. * As a side note, I need to point out one key detail. For purposes of this blog, I consider both sides of the Southfield Freeway that are south of Joy Rd. to be "Warrendale". The WCO, however, only covers that portion of the neighborhood that is west of the freeway; east of the freeway is the Warren Avenue Community Organization. I have been trying to contact an officer on the WCO regarding a burned out home on Abington, north of Warren. Could you please assist? Actually, you're going to want to talk to the City of Detroit's Department of Buildings & Safety Engineering. They're the ones responsible for dangerous buildings. You can reach them at (313) 224-2733. If you have any other problems with them, please shoot me an email - frank.nemecek [at] gmail.com. As a quick reminder to everyone, the next general membership meeting of the Warrendale Community Organization will be tomorrow evening, Monday, April 7th at 7 pm. The meeting will happen in the School Building at St. Thomas Aquinas Church, which is at 5845 Auburn, 2 blocks east of Evergreen. Please enter through the middle doors. All residents and business owners in the Warrendale neighborhood are invited to attend. The meeting should last approximately two hours. The Detroit Public Schools will hold a Turnaround Meeting on Monday, April 7 at Cody High School from 4 p.m. - 7 p.m. The purpose of the meeting will be to inform the community at large about changes that will take place at several targeted schools in the city of Detroit.